An original Red Skelton on linen, done in a mixed media, handsigned by Red Skelton. The piece is titled, "Freddie Pays a Visit," and is dated 1983. The painting is 18" x 18" and framed to approximately 29" x 29". The painting is in near mint condition with a few marks on the upper left of the linen. The frame and glass is in poor-fair condition. The piece comes with a certificate of authenticity. This is your chance to own an exclusive painting by the late comedian and actor, Red Skelton. 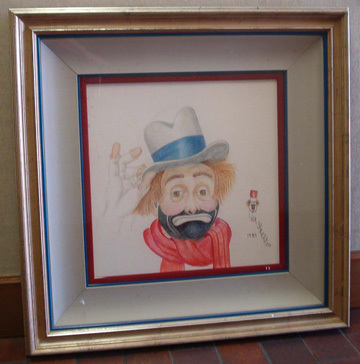 We have several other pieces by Red Skelton that you can view here.